Everything’s fine. Really. No need to hurry home. Both Large Smelly Boys are making noises about wanting to be an only child, but I’m sure it’s nothing. The Large LSB has a Judy Garland film on the telly. The Small LSB does not want the Judy Garland film on the telly. The giant moth you tried to whack with a broom and some choice words is toast. I found it on the stove. It was near the little black skillet. Don’t worry, I cleaned it — the skillet, not the moth — even though you’re the only one who had eggs for breakfast and it’s etched in the marriage contract that scouring it is your job. Judy Garland is throwing statues across a room and trashing it. I didn’t know she was left-handed. The moth has been replaced by the She Cat. At only 9 pounds, she is only slightly bigger than the moth, but she takes up all of your side of the bed and most of mine. School starts in less than a week, on Tuesday. Make that 6 days, 5 hours, yadda yadda, but I’m not counting. Felix/Martha has already taken all his back-to-school letters from his teachers and marked them up with a red pen. Felix/Martha has already taken his school-supply list and marked it up with a blue pen. Tomorrow is school-supply shopping day. Judy Garland just threw a hatchet across the room. The Large LSB unpacked his clothes and put his suitcase away. When I asked about the jumbled pile ofÂ clothes in the middle of the floor, he said I only asked him to unpack, not put away his clothes. The She Cat’s snoring is only slightly louder than the moth, but quieter than your choice words. If I fly half-way around the world, that would make Tuesday come earlier, right? Because that’s a lot of time zones. Like 6 days, 5 hours, yadda yadda. The Older Educated Daughter said she would come with me so that we could double the number of time zones shifted. Maybe we could organize a tour and multiply the effect. Judy Garland is singing, “You can do no wrong.” Judy Garland is only slightly louder than the moth and the She Cat, but quieter than your choice words. The Large LSB made spaghetti. Most of the noodles ended up next to the moth. Tuesday would be a safe day for you to come home. The school-supply shopping list includes pencils, paper … and pants. Besides a time change, there’s another obvious advantage to being half-way around the world. I would be half-way around the world. I have to be home on Tuesday, though. That’s only 6 days, 5 hours, yadda yadda. I plan to clean house that day and throw out a bunch of junk. The first thing I will throw out is a cap to a bottle of Maker’s Mark. To be reminded of why pant-shopping stores are also known as Chasms of Hell, click here. If you dare. 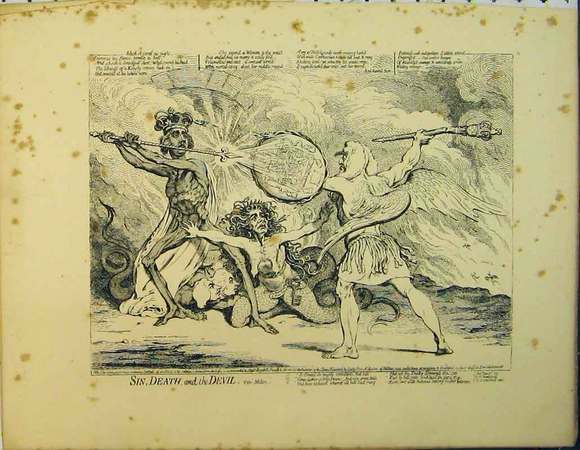 ILLUSTRATION: Engraving by H. Humphrey of “Sin Death and the Devil,” circa 1804. You can buy it here for $22.19. The site says it’s a genuine antique and not a modern copy. It doesn’t say whether H. Humphrey ever ran for president.